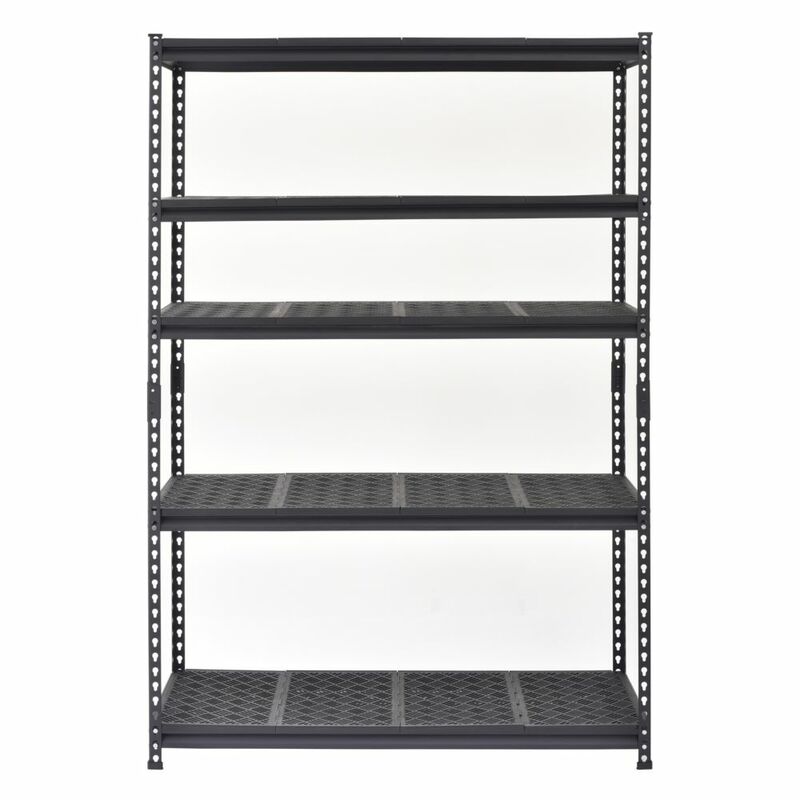 You can assemble this Muscle Rack heavy duty steel shelving unit vertically as shelves or horizontally as a workbench for your office or home. Its neutral colour goes with everything in your home. You can adjust this multi-purpose unit's shelves in 1.5 in. increments to fit any storage need. It features a rivet lock system that provides strength and rigidity. Keep larger items off the floor with the Gladiator Gear LoftShelf. This heavy-duty steel shelf can hold up to 100 lbs. Included dual-mounting shelf brackets can be installed on the top or the bottom of the shelf. Designed for use on separately sold Gladiator GearTrack Channels and GearWall Panels, the shelf can be hung easily, and repositioned simply, as often as needed. A lifetime limited warranty provides peace-of-mind that it is built-to-last. The Honey-Can-Do SHF-04058 Adjustable Shelf with Basket Cabinet Organizer offers a versatile and flexible storage solution that adjusts in height to accommodate tall or shorter items in most cabinets. The contemporary design and brilliant chrome finish present a polished look when you open your cabinets. Handy and sizable, the wire basket pulls out for easy access to the contents inside and is removable, if desired. This shelf works great in cabinets that are 18-inch wide or larger. Perfect for storing kitchen items or for placing under bathroom sinks. Create visible, accessible storage space instantly with the Honey-Can-Do Heavy-Duty Chrome Urban Valet with Wheels. The contemporary chrome finish and sturdy steel frame offer the perfect blend of style and functionality. Durable enough for the mudroom, garage or basement, the multi-use valet serves as both a shelving unit and garment rack, with rolling casters to ensure easy mobility around your space. Supporting up to 600 lbs., the valet also features adjustable shelves and is easy to assemble without any tools needed. 72-inch H x 48-inch W x 18-inch D 5-Shelf Steel and Resin Shelf You can assemble this Muscle Rack heavy duty steel shelving unit vertically as shelves or horizontally as a workbench for your office or home. Its neutral colour goes with everything in your home. You can adjust this multi-purpose unit's shelves in 1.5 in. increments to fit any storage need. It features a rivet lock system that provides strength and rigidity. 72-inch H x 48-inch W x 18-inch D 5-Shelf Steel and Resin Shelf is rated 4.8 out of 5 by 4. Rated 5 out of 5 by Garage from I love this shelf! I’m a young woman only 5 feet tall and I was able to assemble this all on my o... I love this shelf! I’m a young woman only 5 feet tall and I was able to assemble this all on my own in a short amount of time. Rated 4 out of 5 by AlexC from These work great for my Wife and I. We bought... These work great for my Wife and I. We bought three total to make room in our garages in order to fit our vehicles so job accomplished. The set up was very easy, just need a rubber hammer and you're good.